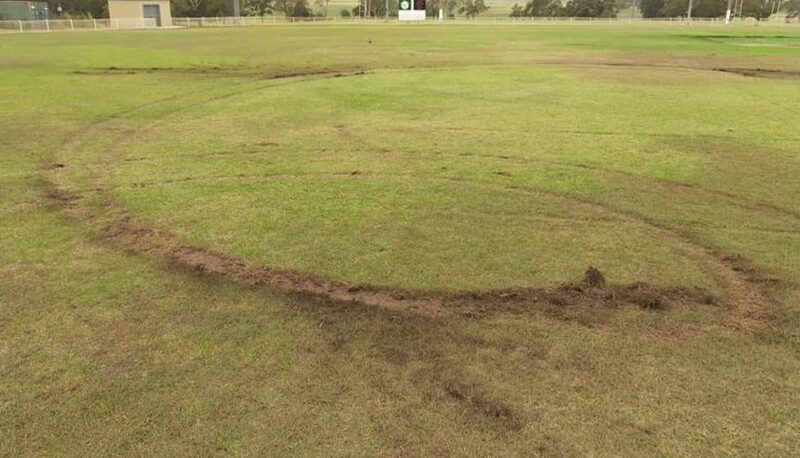 Tenambit Morpeth Cricket Club members have been left heartbroken and in shock after vandals tore up their home ground in a senseless weekend attack. Unknown offenders smashed down the fence with a vehicle and ripped up the grass by performing donuts. Luckily the pitch itself was left unscathed. Club officials were alerted to the destruction by a passer-by on Sunday. Tenambit Morpeth Cricket Club president Damien Miller said he was in “disbelief” when he heard the news. He said volunteers poured their hearts and souls into the ground, most of all the curator Shane Wind. Mr Miller said Mr Wind, who was on holidays when he was told what happened, put several hours work in most days to have the ground looking spick and span. The ground is used by the cricket club in summer and Morpeth Rugby Club in winter. Mr Miller said the incident was a particularly painful blow as he felt Morpeth Oval was often overlooked for maintenance in comparison to Maitland Park. The spokesperson said the ground is expected to be repaired and ready for use in time for the Morpeth Tenambit Cricket Club’s next home match on Saturday, February 2. If anyone has any information about the destruction of the oval, they should contact Crime Stoppers on 1800 333 000.